Preparation time: 20 to 25 min. The fresh flavors of cucumbers, green peppers, green onions and celery are combined together in an easy make-ahead salad that can be molded into attractive individual salad molds. Paprika Dressing: In saucepan, heat 1/2 cup sugar and 1/4 cup lemon juice just until sugar is dissolved. Add 1 tsp. celery salt, 1 tsp. paprika, 1 tsp. Dijon-style mustard and 1/2 tsp. grated onion. Slowly add 1 cup salad oil while beating until dressing is thick. Makes 1 1/2 cups. Double the ingredients and use a 6 to 8-cup mold. 1. In mixing bowl, stir lemon gelatin with chervil and tarragon. Add boiling water. Stir until gelatin is dissolved. 2. Cool in refrigerator or over ice until syrupy. Stir in sour cream, vinegar and salt. Fold in vegetables. 3. Pour into 4 lightly oiled individual molds or a 3 to 4-cup mold. Cover and chill 2 hrs. or overnight. 4. Unmold onto individual serving plates or large platter lined with lettuce. Serve with Paprika Dressing. Good served with: Summer picnic menus or patio barbecue meals. ©MCMLXXXIV My Great Recipes All Rights Reserved. Printed in Holland. 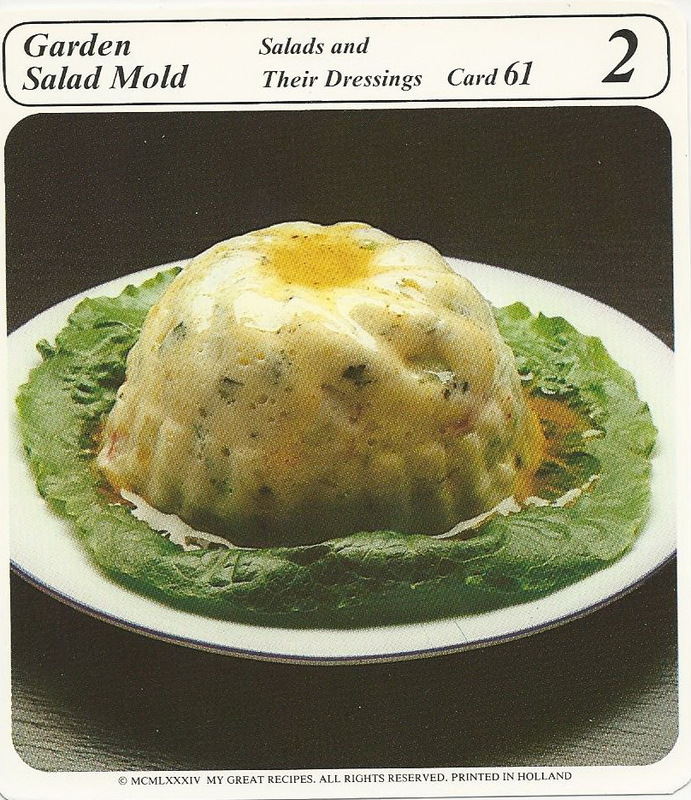 You know when the dressing part starts with : “in a saucepan” this is not going to be the everyday kind of dish….